Team Suzuki Press Office – May 11. 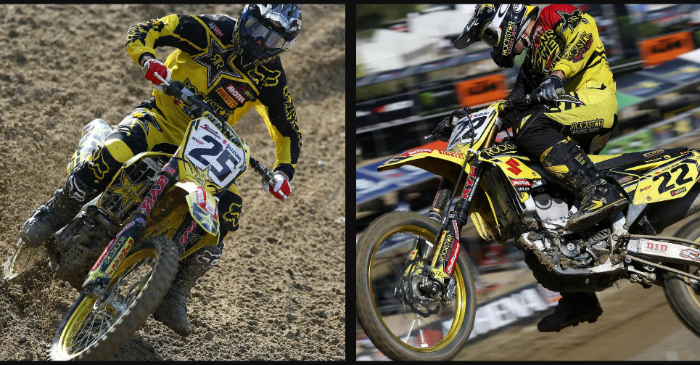 Rockstar Energy Suzuki’s Clement Desalle was virtually perfect in both races on his dependable factory RM-Z450 to take his first double-victory of the season and his second overall triumph of 2014 at today’s seventh-round World MXGP Championship race at Talavera de la Reina in Spain. The Belgian also rose to second place in the MXGP championship standings as a result and narrowed the difference in points to just 24 from leader Antonio Cairoli. Around 16,000 fans witnessed the action in what had been a long, three-year wait to welcome MXGP back to Spain and were treated to a masterclass of riding from Desalle and a showcase of aggression and effort from team-mate Kevin Strijbos, who finished third overall for his third podium celebration of the year and another impressive Suzuki trophy double. Turn, climb, drop, turn, climb, turn: Talavera weaved across the low Spanish hills like a frenzied snake and the narrow layout pushed the riders together and was frugal with overtaking opportunities. A mix between hard-pack and some softer sections along with plenty of ruts in the turns meant the track was not overly difficult but had a technical edge and temperatures in the low 30s signified a tough day for the Belgian crew. Desalle in particular was struggling with a stomach problem on Saturday, so his speed and form on Sunday was a little surprising; even to the rider himself. His motos were almost carbon-copies: superb starts at the peak of the MXGP field around the first three turns, rapier pace; and unfaltering consistency. The first race was clear-cut as he pulled away in his won rhythm. In the second, Desalle weathered some pressure from Cairoli but held firm and maintained his lap-times to again drift clear of the Italian in the closing stages. The day represented his first 1-1 scorecard since last year’s Grand Prix of Czech Republic. While Desalle set the pace, Strijbos had to gain positions and work at eroding time differences to other riders. His attack on Cairoli and Evgeny Bobryshev in the last two laps of Moto1 to rise to fourth place was excellent and he helped push Cairoli into a Suzuki sandwich in Moto2 by running a high tempo in third position and Strijbos took the lowest step of the podium for the third time in 2014. While Desalle retains second spot in the MXGP points table, Strijbos is not far away in fourth. All back to Lommel now for Rockstar Energy Suzuki World MXGP and a free weekend ahead. The eighth round of the FIM Motocross World Championship will take the series into the sloping confines of Matterley Basin for the British Grand Prix on May 25th. The length of the 2014 contest is expected to slim from 18 to 17 rounds with confirmation of the cancellation of the date previously reserved for the Ukrainian Grand Prix in August coming this week.